The video above is of rapper Yelawolf tearing down the stage at a fools gold party in New York. He will be in SF for the Wake and Bake show October 19th. 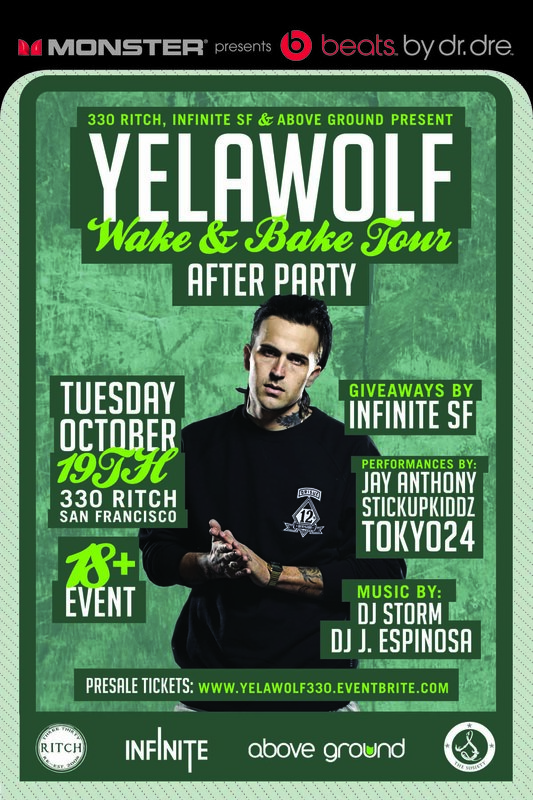 After the Wake and Bake concert however, if your located in the Bay Area, head on over to 330 Ritch, Yelawolf will be in the building, along with myself, Tokyo 24, Stickup Kidz, J. Espinosa, and Jay Anthony. The party is being put together by the one and only ‘Above Ground’, and there will be giveaways from Infinite SF, and the party is sponsored by “Beats: By Dr. Dre”. It’s going to be a HUGE event, dress to impress, doors open at 10, and its 18+ in the spot, so anyone can come through. See you there.